As much as we love the wizarding world of Harry potter, you got to admit there are a few things that left us a bit confused. A lot of these things were actually in the execution of the movie, so it’s not JK Rowling’s fault. But we can’t help but notice. 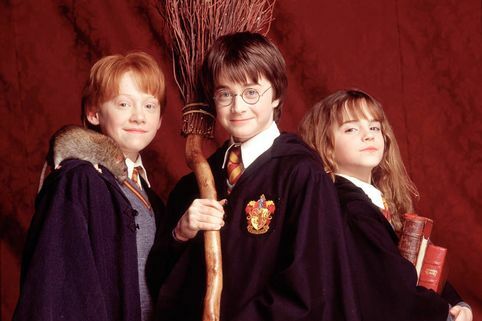 So let’s take a look at the top 10 HARRY POTTER MOMENTS THAT MADE NO SENSE. We have HAGRIDS PARENTAGE. Hagrid is half giant. Let that sink in for a second if it hasn’t already. The guy has one human parent and one giant parent. And if he’s as big as he is being only half giant, imagine how big his full giant parent would be. And that was his mom, Fridwulfa. And dad was apparently a tiny little man too. I don’t want to know how it worked, and more importantly, I don’t want to know why it worked. This is GINNY WEASLEY. To people who have only watched the movies, Harry ending up with Ginny seems really weird and out of place. Like she was an afterthought. But what people who read the books know is that the book version of Ginny was insanely better than the film version. Her character was mangled; she was dynamic and spicy, and the movie reduced her to the human equivalent of a damp tissue. Don’t get me started on the shoelace scene. We got WINKY. Dobby the house elf was such a popular character both in the books and the movies; you would think they would want to capitalize more on the house elf craze. They skipped over the whole society for the promotion of elfish welfare storyline, but what was confusing is why the films didn’t introduce at least Winky. She was a troubled and depressed elf who would have brought a lot of entertainment to the films, and she even had concept art for the goblet of fire. We have BEM. Yeah, this kid. We’ve all seen him. Who the hell is he. Apparently he’s in Gryffindor, but according to the books only 5 kids were in Harry’s year for Gryffindor, so Bem as we know him as, is technically not canon. The only purpose this guy serves is to show up and say something dark and then disappear and we don’t see him again, like thanks for that? He doesn’t even get credited in Prisoner of Azkaban by name, only as Boy 1. And if he was thrown in there for diversity, why not make a more prominent character diverse instead? We have MOANING MYRTLE. Moaning Myrtle Warren was a Raven claw who was killed by the basilisk while using the washroom one day. When she died she was only about 14 years old. Yet, the production thought it would be a good idea to cast a 37 year old to play her. Now don’t get me wrong, Shirley Henderson played the role quite well. But it just seemed odd to cast a middle-aged woman when there was so much underutilized talent in a whole cast of youths. But not you, Bem. We have HARRY OPENING HIS LETTER. One of the things we would do if we received a letter is take it to our room or our cupboard under the stairs and open it in privacy. Just in case. But Harry tries to open his letter from Hogwarts right in front of them. Obviously he’s not a dumb kid, so it’s a little confusing to see him be so careless. We’re going to chalk it up to him being too curious and impatient to wait for the few steps it took to get back to his cupboard. But next time, just stash it in your shirt dude. We got THE OF STUDENTS IN EACH HOUSE. We know that the sorting hat takes into account a student’s persona as well as their preferences when deciding which house to put them in. So how is it that every year there seems to be the exact same number of students in each house? There’s no way there can be the same amount of ambitious and cunning kids as there are brave and daring. Does the hat just start filling out quotas on the last bit of sorting? ‘Oh, need me a few more Hufflepuffs so I’m just going to tell that obvious Raven claw to join’. We have DUMBLEDORE AND THE GOBLET OF FIRE. Thank god for memes, what would we do with all our spare time? Perhaps re-read Goblet of Fire and notice the line reads “Did you put your name in the goblet of fire Harry” Dumbledore asked. CALMLY’. Yes. Calmly. Was the movie version the epitome of calmly? show clip* Literally anything but! HARRY’S MOM. Yet another casting decision that made zero sense. Throughout the novel and the movies and literally anything Harry Potter we are reminded time and time again that Harry has his moms eyes, his mom has Harry’s eyes, and you got your mother’s eyes Harry. So naturally you’d think the casting would want to stick to the biggest descriptor ever. But for whatever reason, in a clip of a young Lilly Potter that existed solely for appearances, they decided to use brown-eyed completely different looking Ellie Darcey-Alden. And didn’t color correct her eye color. You guys had one job. We have HARRY POTTER AND THE CURSED CHILD. Harry Potter and the cursed child was a 2 part stage play that premiered in 2016. Now theatrically, it as a good play that got a lot of positive attention. But to Harry Potter fans? Not so much. Because this play got so much wrong. Hermione is salty over Ron. Harry’s fear of pigeons. The no sugar diet. The trolley witch can shoot spikes. Cedric becoming a death eater? Why, why, and more? I could go on but maybe you should see the play first. Have fun, don’t get too angry at it. So those were the top 10 HARRY POTTER MOMENTS THAT MADE NO SENSE. Let me know in the comment section down below WHO YOUR FAVE HARRY POTTER CHARACTER IS.